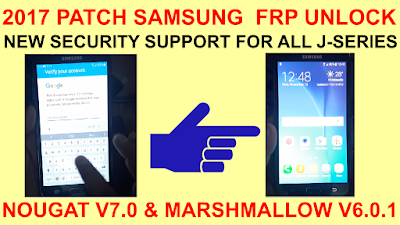 2017 PATCH SAMSUNG FRP UNLOCK NEW SECURITY SUPPORT FOR ALL J-SERIES NOUGAT V7.0 & MARSHMALLOW V6.0.1. Required Files To Frp Unlock For Nougat V7.0. 1# Download Frp Lock Removed Tool. Note: Your Need Tool Activation.Comment Your Hwid On Youtube & Below. 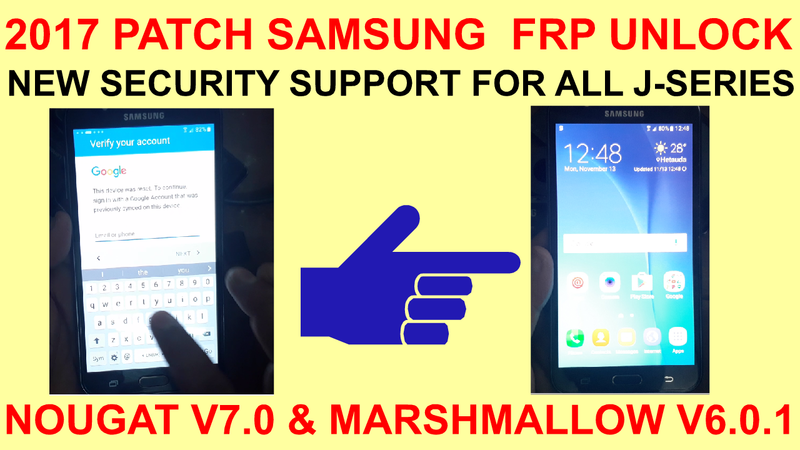 How To Remove Frp Lock On Samsung Nougat V7.0. 3# Three time tab click home button. 4# Now open talk back. 5# Slide like 'C' on screen. 7# Now 3 time click home button.then talkback is disable. 8# Click 'Help & Feedback' tab. 9# Typess 'Voice' Show 'Get started with voice acces' open it. 10# Play video.Click share tab. 13# Go to 'Help & Feedback' open it. 15# Download Development Setting Apk. 16# Go to download History. 17# Install Development Setting.Open Phone Setting. 21# Disable 'Feed' tan enable. 22# Now typess calculator.open calculator. 23# Typess " (+30012012732+ ". 24# Code in Dial window : " *#0808# "
25# DM+ACM+ ADB Select & Rebot Phone. 26# Connect your phone on pc using usb data cable. 27# Open download frp remove tool. 28# Click frp remove tab on tool. 29# 2 sec watting.frp remove show ok.
30# Now your phone frp remove & rebot your phone. If You Have Some Problem Related With This Post.You Should Watch This Video.Samsung Nougat V7.0.